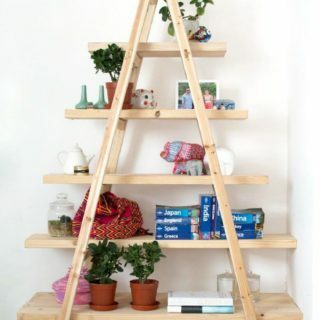 As crafting and DIY enthusiasts, we’re constantly making cool things for ourselves. 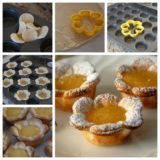 Sometimes, however, it feels nice to use our skills to make something for someone else! 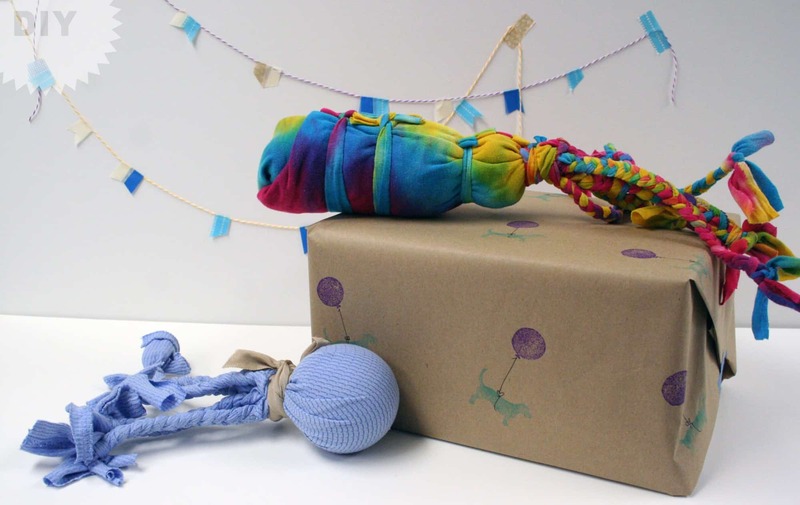 The humans in our lives get a lot of gifts too, and on quite a regular basis, so recently we’ve been thinking about making nice things for our pets. The critters in your family deserve love too, after all! 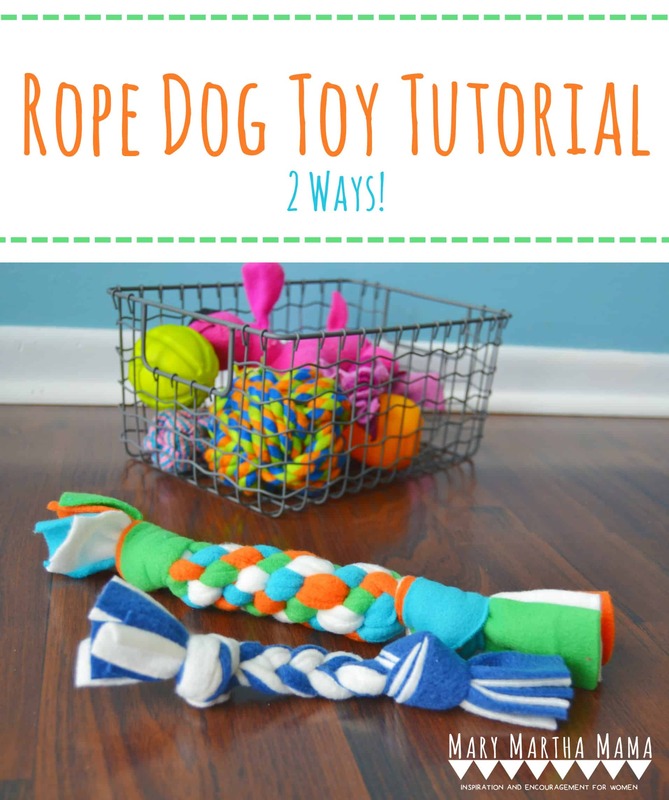 That’s why we’ve had our eyes peeled for resources that will help us make pet toys. 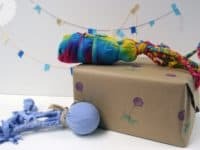 Just in case you love the idea of making your very own pet toys too, here are some of the very best ideas, designs, and tutorials that we came across in our search of info and inspiration! Is your dog the kind of feisty little beastie who loves to play tug-of-war and will pull on just about anything? 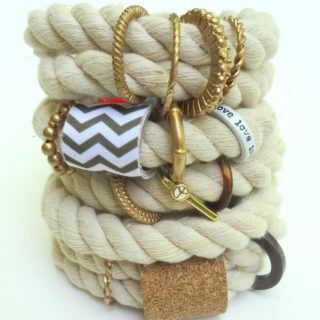 Then you’ll definitely have success making them a tugging rope just like the kinds you’d see in stores! 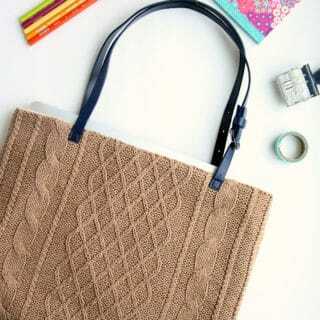 The only difference is that this kind can be braided out of rope or felt. 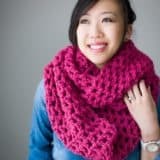 Get the full instructions for making your own on Mary Martha Mama. 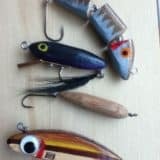 Our dogs and cats love playing with anything that makes a sound just because they find it fun but, for some animals, having a toy that makes a sound is actually more of a need! 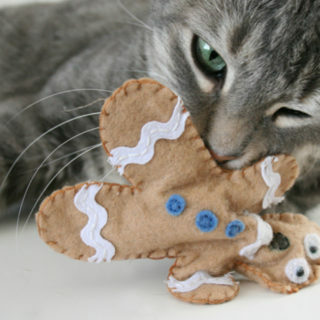 For example, blind cats and dogs actually find their toys and track the toy’s motion by listening for how the sound changes. That’s why we thought this bell ball outlined step by step on Slim Doggy was such a good idea. 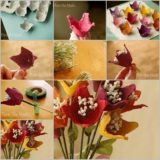 If you’re going to put in the time and effort that making an animal toy from scratch takes, would you prefer to use that as an opportunity to do a bit of upcycling as well? 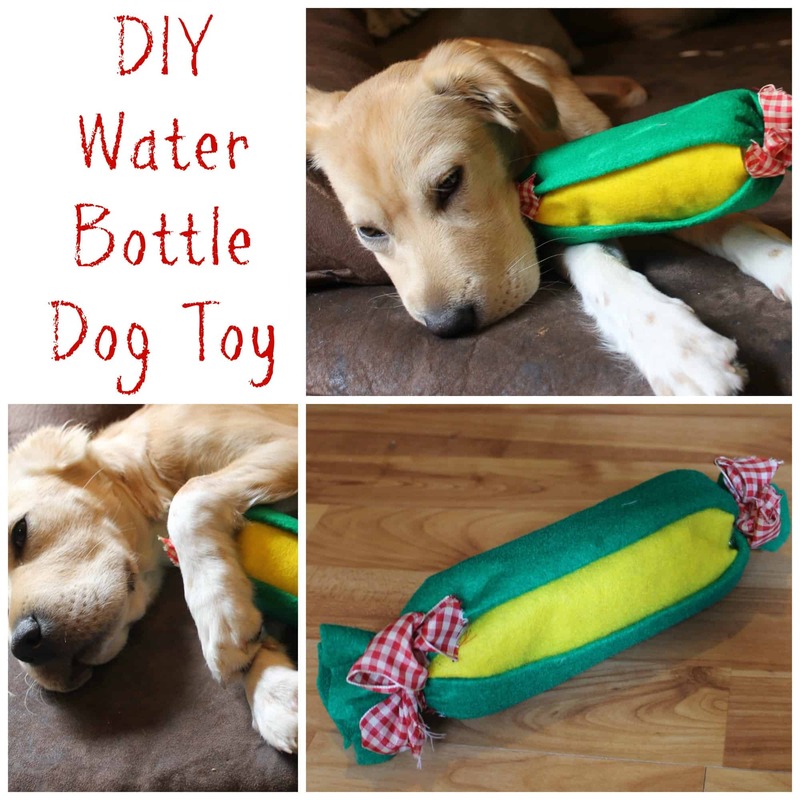 In that case, we’re convinced you’ll get a kick out of the way Two Little Cavaliers made this fantastic crunchy toy (which also makes a sound, regarding what we mentioned above) using a recycled plastic water bottle! 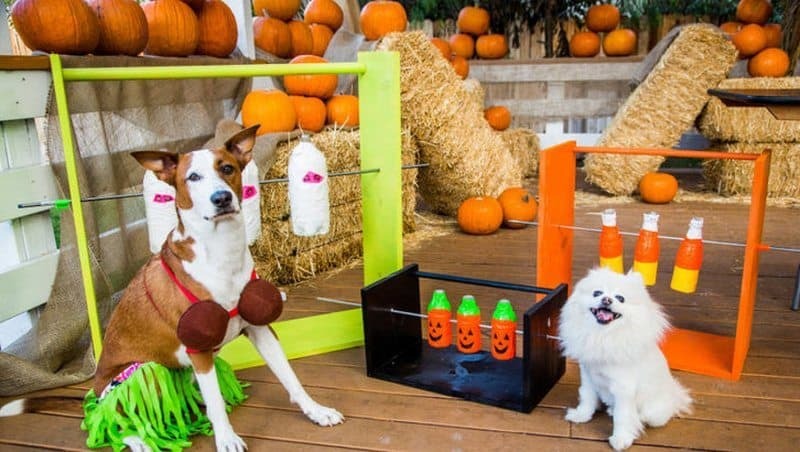 Perhaps your dogs are the kind of excitable players that love toys so much that they’ll even keep themselves amused during parts of the day that you don’t have the time or spare hands to actually play with them? 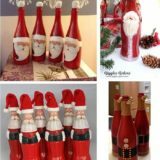 In that case, they just might be the perfect pooches to make something like these painted plastic bottle spinners for! 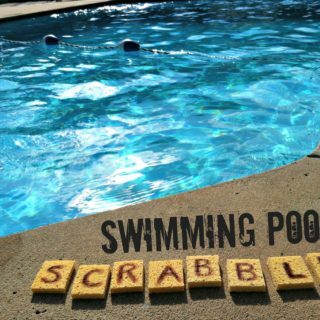 Get the full details for how they’re done on The Owner-Builder Network. 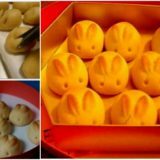 Dogs aren’t the only pets you can make toys for, of course! 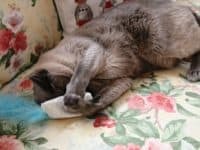 We’re completely in love with the way My So Called Crafty Life made their cat a feather and catnip toy in just a few simple steps. 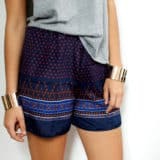 We love that this project involves softer materials and simple sewing skills because those are where some of our very best DIY abilities lie. 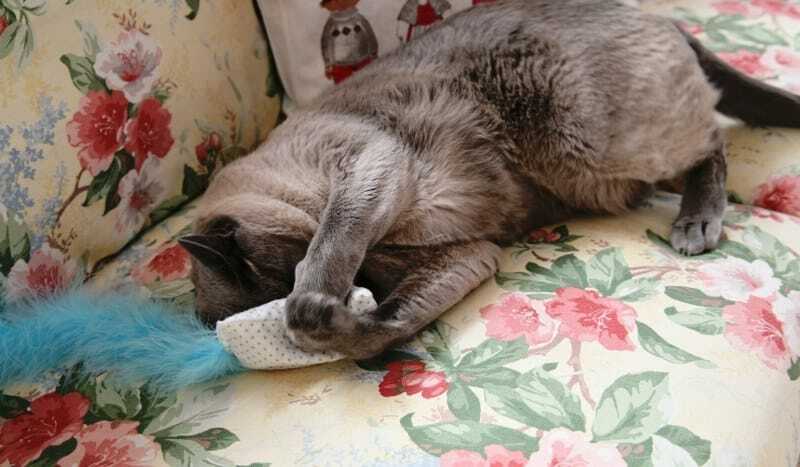 Also, our cats really love catnip! 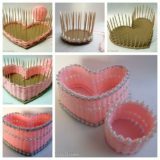 Did we really catch your attention when we started talking about the idea of using a DIY pet toy as an upcycling opportunity but you’re just not sure any of the ideas you’ve seen so far have quite been the ones for you? In that case, we’d definitely suggest taking a look at how Pillar Box Blue made these awesome denim bones from old jeans! 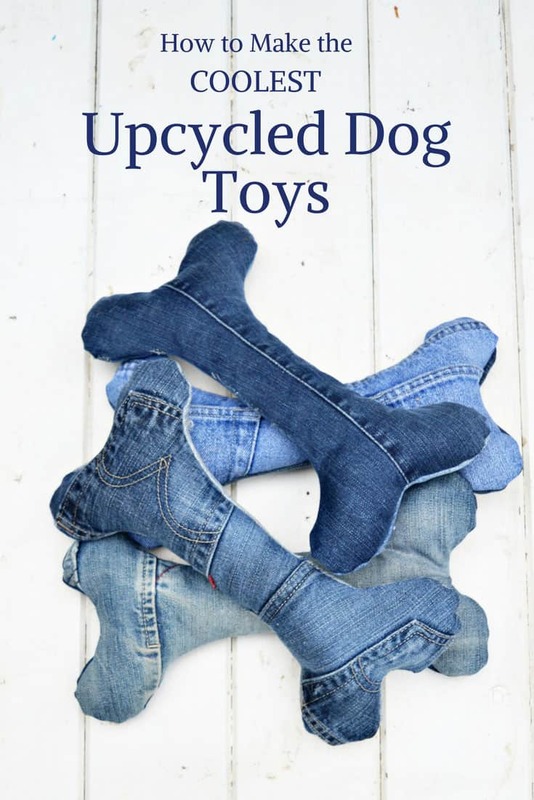 The stiffer fabric of the denim gives your dog something satisfying but not too hard to chew on and play with. 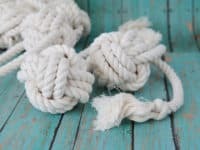 If you’re going to make a pulling or tug rope for your dog, would you actually prefer to make the most durable one you possibly can because your pooch is quite feisty indeed? In that case, we’d definitely suggest taking a look at how Instructables outlines making a pulling ring that’s made from strong braided rope and gives you a better grip too so the game isn’t too easy for Doggie. 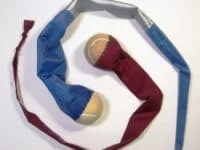 Would you rather give your dog something a little more uniquely shaped to play tug-of-war with because you know he likes to steal it and play with it on his own as well? 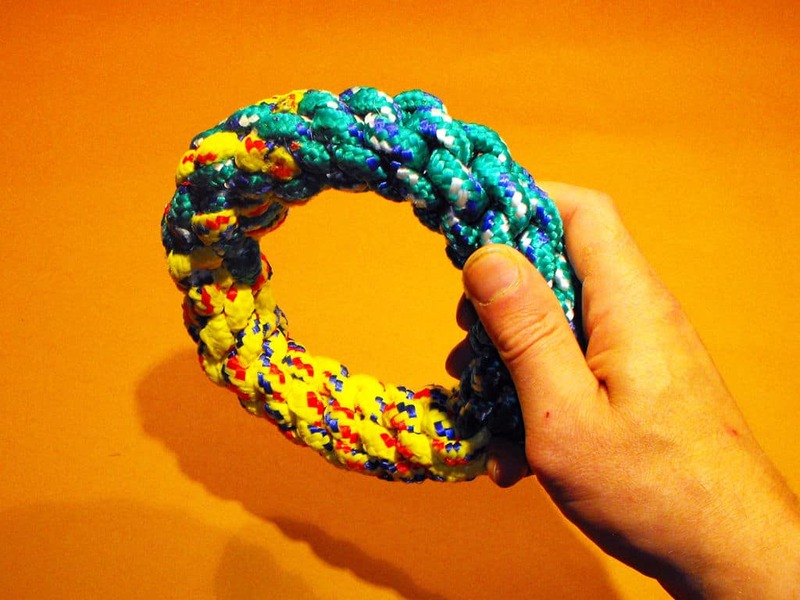 Then we think this pull toy that is also a chew toy and a way to upcycle t-shirts might be just the project for you! We’re very pleased indeed with how clearly Ammo the Daschund outlines the steps for making one of your own. 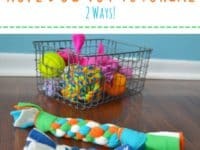 Have you actually been scrolling through our list hoping to find something a little more low maintenance and cost effective to make because your dog’s last few toys have finally bitten the dust, but you don’t have a whole lot of time and materials on your hands? 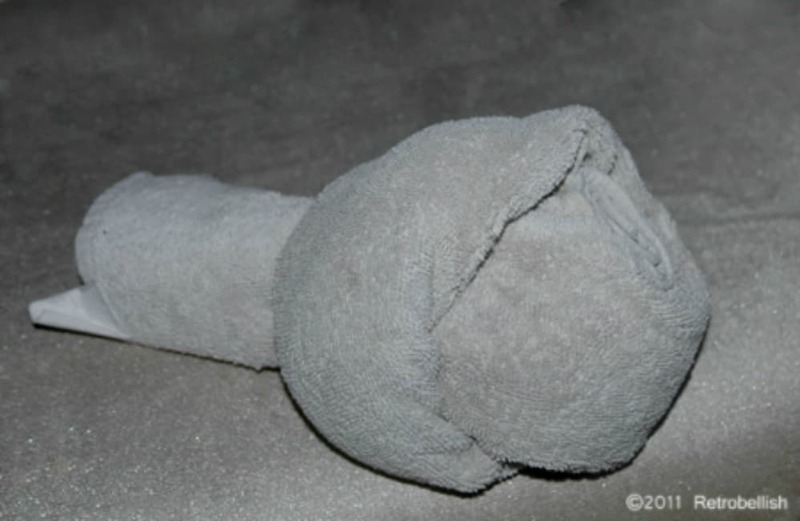 Then maybe this knotted towel tug toy concept outlined on Retrobellish would be a little more up your alley! We actually make these for our dogs from old towels whenever we have them and don’t need new cleaning rags. 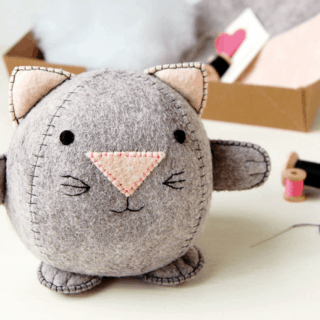 What if the circumstances of needing something quick, easy, and made of things you already have are true but you’re actually hoping to make toys for a cat instead? 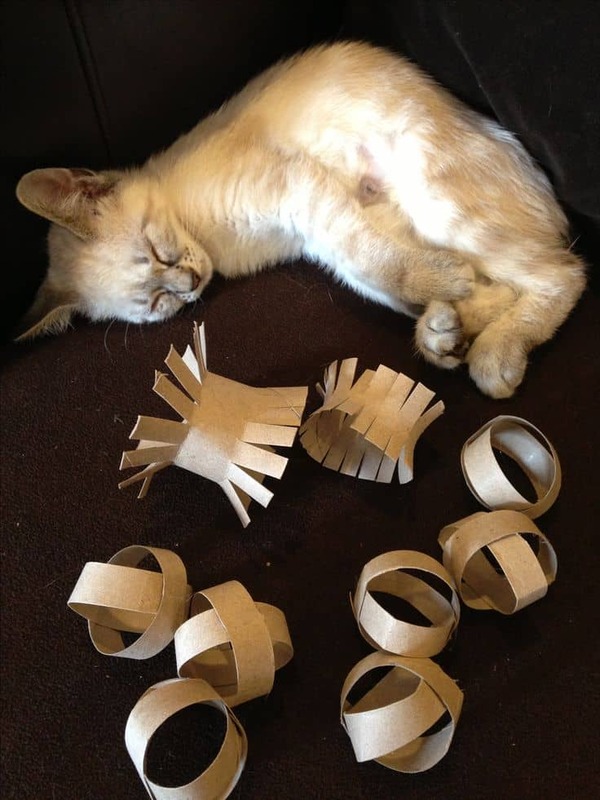 In that case, we’d absolutely suggest taking a look at the way Catster made these fantastic little bouncing cat balls and fringed toys from- you’re seeing that right- empty cardboard toilet paper rolls! It really is that simple. 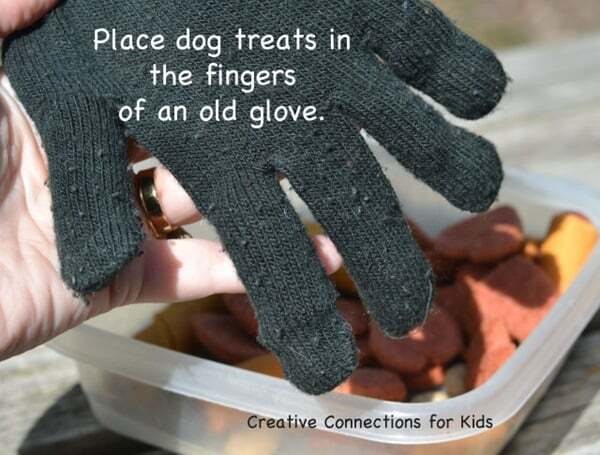 Just in case you’re not quite finished with the idea of upcycling household things yet but you still haven’t quite found an idea that really grabs your attention, here’s a fantastic concept from Creative Connections for Kids that’s made using an old winter glove! 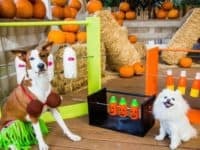 We love the way they filled it with small dog treats to entice their dog into playing with it. This way, there’s a snack inside of Doggie accidentally tears through the fabric, rather than just stuffing. 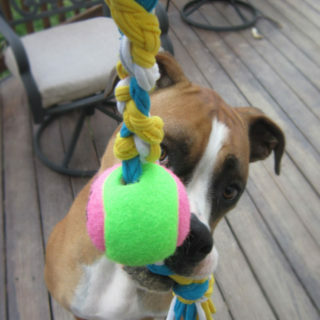 Does your dog absolutely love playing with rope toys, no matter their shape, because he loves the feeling of chewing on rope since it’s more durable and doesn’t come apart in his teeth as easily? In that case, we think you might have better luck with something like this fantastic rope ball, which Hands Occupied is here to show you how to make in just four simple knotted steps. 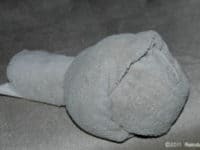 We know we’ve talked a little bit about the concept of needing last minute, low maintenance doggie toys, but what if you’re looking for another version that’s also a bit of a treat for your pooch on special occasions? 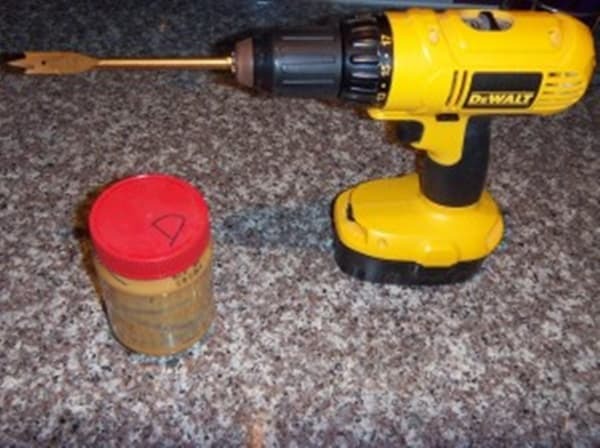 Then we’d absolutely suggest taking a look at how Pardon Our Sawdust turned a nearly-but-not-quite empty jar of peanut butter into a snack release play-thing using nothing more than a regular household drill! 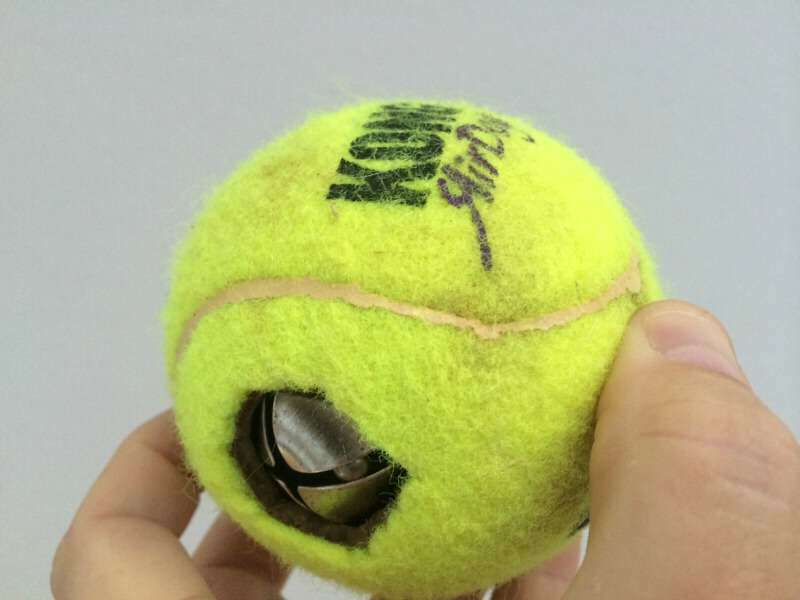 Have you actually been looking for a way to make your dog’s favourite tennis balls a little more varied and interesting, making sure that he gets to play with what he loves but you’re still putting a twist on things? 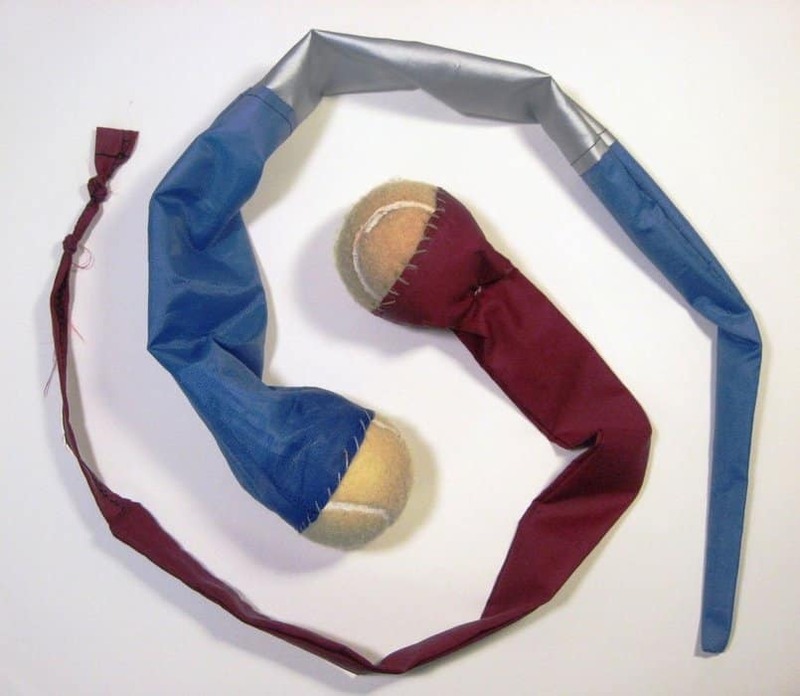 Then we think you simply must take a look at the way Instructables made these “fox tail” style toys that you can throw like a tennis ball, but with more fun involved because they can be swung around and picked up by the “tail” end. 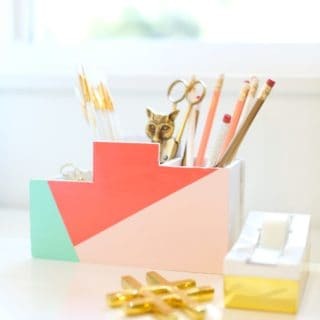 Are you actually still scrolling through our list finding yourself thinking about the idea of toys that have treats in the middle like a surprise, but your dog is very smart and great at tearing into things so you need to make something that’s a little more challenging? 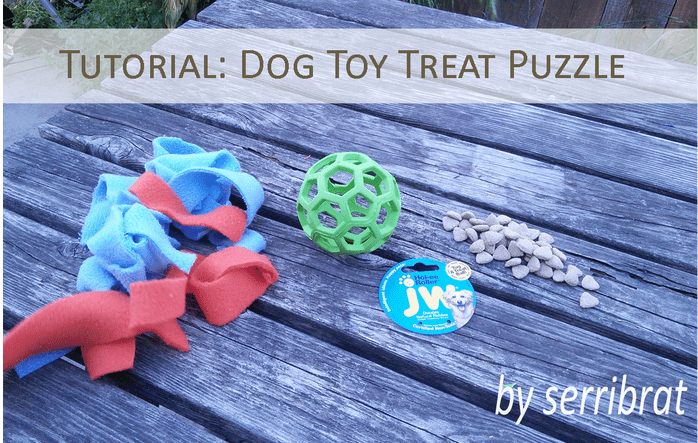 Int that case, we’d definitely suggest taking a better look at this tutorial from Serribrat to see how they made this fantastic dog treat puzzle inside a hollow dog toy that’s been wrapped in felt strips!